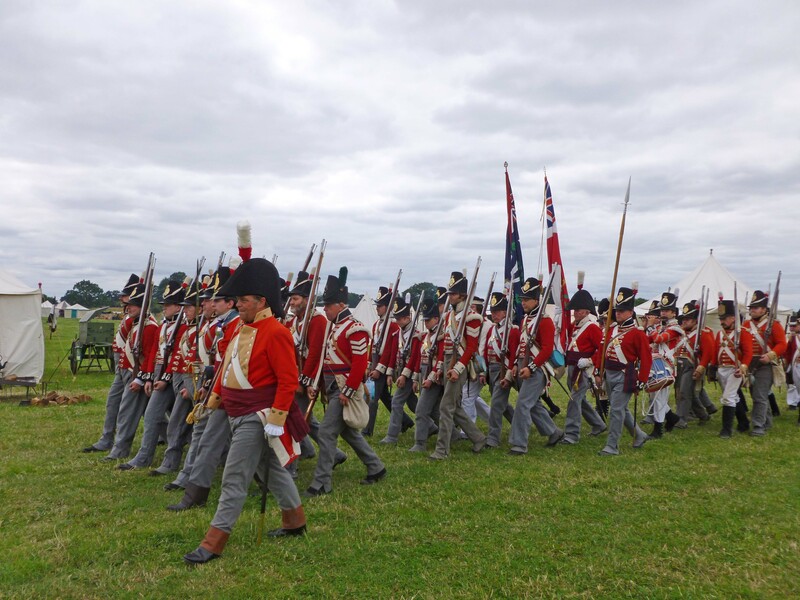 It was Spetchley Park 2014 when, along with many other Napoleonic regiments, the 32nd successfully overcame the rigours of Waterloo accreditation and we commenced the final leg of our journey to meeting and defeating Napoleon in Belgium in June the following year. 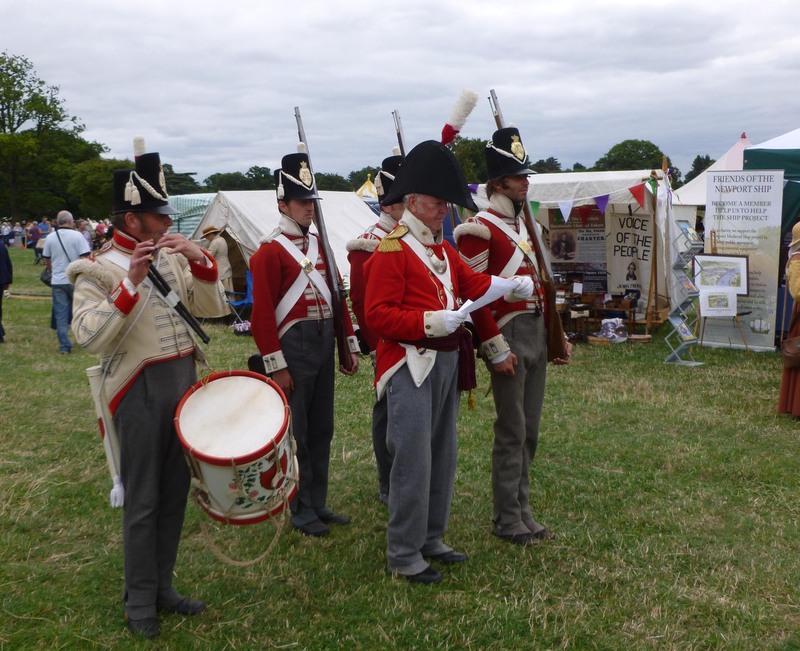 The 2015 Spetchley event, only 8 weeks after that most magical of bicentenaries, had a limited representation from a number of Napoleonic Regiments. 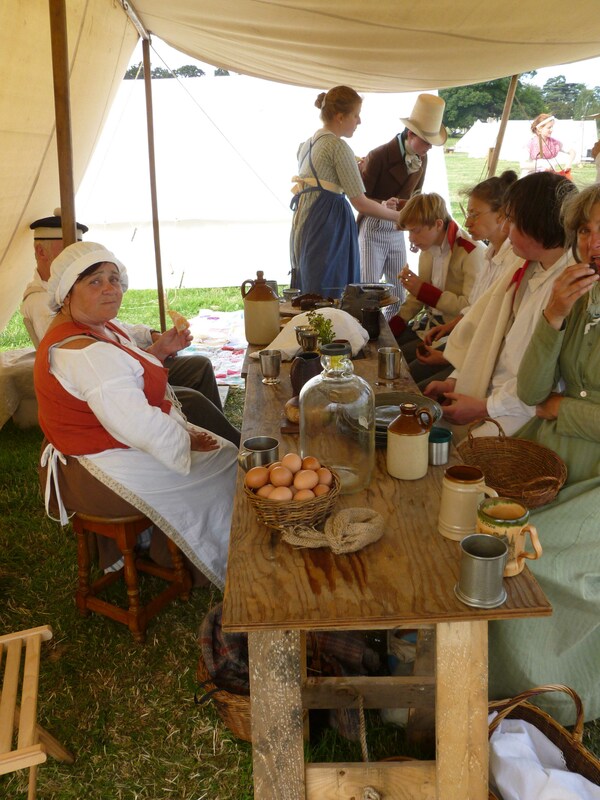 This year however the “Napoleonics” were back in force – accounting for more than a quarter of the total 900+ re-enactors representing a dozen or more eras. The 32nd once more held their heads high and were strongly represented by Wendy, Louise, Sue, Nicky, John, Eddie, David, Peter, Philip, Nigel, Aidan and Bob – together with very welcome guests Helena, Isabel and Zack. Other regiments present included 2nd, 4th, 6th, 23rd, 44th, 1/95th and 2/95th. 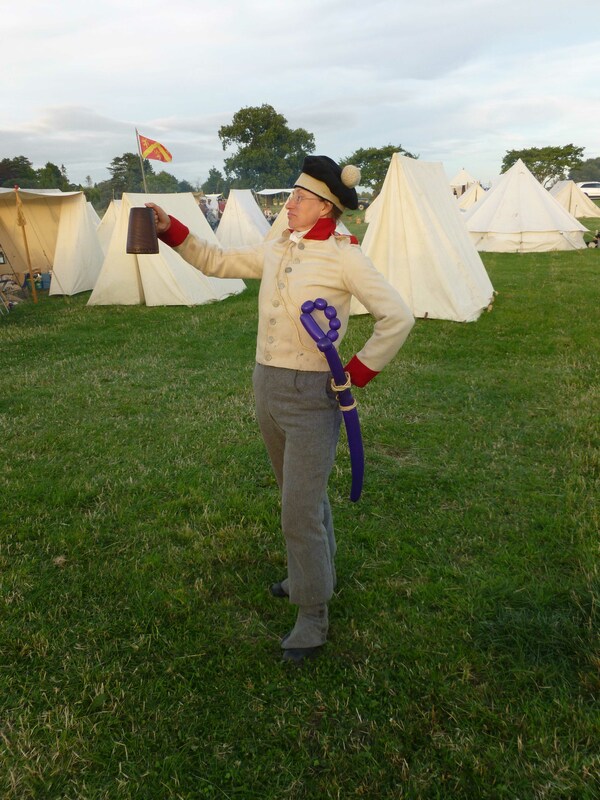 Saturday’s agenda had a very familiar ring to it – Officer’s meeting at 09:00, Living History in our camp from 10:00, Brigade drill at 10.30, skirmish with the French in the main arena at 12:50 (French to win ‘cos it’s Saturday!) and a closing multi-period parade at 16:30. Unlike last year – when somehow the Allied army was actually outnumbered by the French – the headache for our senior officers on this occasion was trying to find a ‘realistic’ scenario by which they could manage to lose to a French army a third of our size and with only 2 cannon. However, it does appear that we do have a group of senior officers who are particularly talented when it comes to ‘snatching defeat out of the jaws of victory’! Hence, in front of a disbelieving and at times jeering crowd, the larger Allied Army managed to suffer yet another ignominious Saturday afternoon defeat! 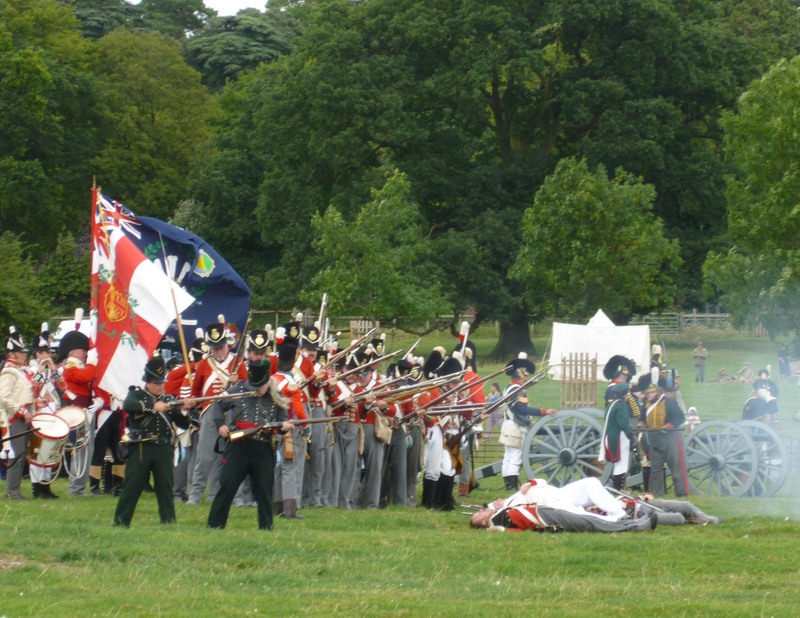 As for the 32nd there are few left to tell the tale – all our firers were killed either by French cannon fire or cut down during the last dramatic advance by the French troops. Fortunately the Colour was successfully saved from capture following a strategic withdrawal by the Colour Party and it was then left to our Ensign to carry the news of the Regiment’s demise back to a devastated group of camp followers! An evening of ‘soul-searching’ followed with much debate about the events of the day over another excellent meal, followed by much ‘drowning of sorrows’ in the Spetchley taverns. 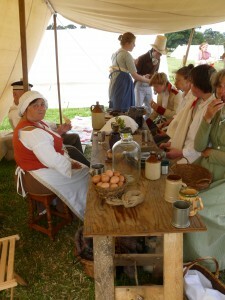 A bright sunny dawn greeted the 32nd on Sunday morning as the camp began to stir, fires lit and breakfast cooked. Strong medicine had clearly been available the previous evening as suddenly we were back to full strength and all raring to make up for losing out to the French the previous day. Further good news was announced at that morning’s officers meeting when it was confirmed that our allies and our ‘missing’ cannon were no longer ‘confused’ and had now returned to the ‘correct’ side! 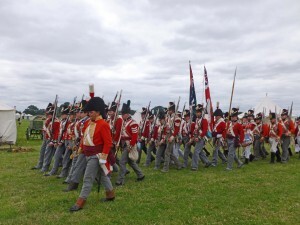 Suddenly Brigade drill became more focused and, following this, the veterans of so many Peninsular battles drew on all those years of experience and marched expectantly to the battlefield. This time a reinvigorated allied army swept aside our French foe, cheered on by a significantly larger crowd than had been present on the Saturday. Once more the afternoon was completed with a colourful parade of a dozen or more groups of multi-period re-enactors from Roman times to World War 2. It was then time once again to break camp, bid our farewells and head south to our respective homes. Another great weekend with so many thanks due to all who made it happen – in particular the fantastic quartet of Wendy, Louise, Sue and Nicky – all stars who make the 32nd special! Also a special mention for Aidan, who ‘stood firm’ under ‘French fire’ for the first time as a member of the 32nd – although he also narrowly escaped a flogging when attempting to spread blackcurrant jam on our Ensign’s white gloves instead of the intended ‘drop-scone’! Copyright © 2016 32nd Regiment of Foot - All rights reserved. Website by John Danning.